We hail from Guntur. At the age of 15, I bagged the National Award working for the All India Radio. I held the B High Grade at AIR. My father was in construction business and he incurred huge losses at the time. We were virtually on the road when I got the opportunity to sing ‘Ee velalo’ I was sixteen when I sang that song. 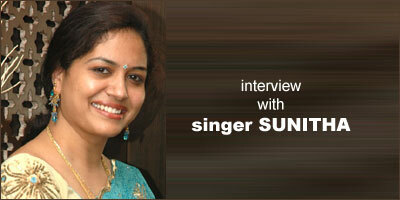 Actually, I wanted to become a light vocal singer (Lalitha Sangeetham). My mother was a good classical singer. This path for me became a boon to our family. I did not get many opportunities after Gulabi. It was Ram Gopal Varma who gave me another chance to sing for his film Anaganaga Oka Roju. Suddenly RGV raised a query as to how it could be if my voice was rendered to the character of Urmila. Actually, Saritha was supposed to dub for Urmila. But, I did it. It felt that dubbing was a kind of a nightmare. What the hell is this that I am doing this dubbing job? I should be singing in films, not dubbing. I hated dubbing. When I was found embarrassed, I was given the chocolates. Anyways, my dubbing was not used and it was simply removed. I did this purely out of my respect and craze for RGV garu. That was again done by Saritha garu. Exactly at that time, both ETV and Gemini TV were started. Sri and Suma got me introduced as anchor through Antyakshari program. I got lot of fame with programs like Navaragam and Yours Lovingly on TV. Now, I found myself travelling on three boats, whereas I thought of establishing a special identity for me as a singer. Fortunately or unfortunately, I had no any big goals in the beginning of my career. While doing my stint with TV programs, I got an opportunity to sing a song in the film Egire Pavurama. Director SV Krishna Reddy thought that being 16 years; my voice would perfectly suit the heroine (Lalia). For that song Magamasam Eppudosthundo, three big singers, including Asha Bhonsle, Chitra and Renuka, rendered their voice. But all the three were rejected and mine had come to stay. It made me enjoy a sense of pride, but not to sink into the head. Next, Krishna Reddy garu made me sing four songs. I also did the dubbing for the film. He convinced me that there was nothing degrading in dubbing, and that too dubbing for the heroines. My dubbing work commenced at Prasad Labs. I was supposed to laugh, but I was found like weeping. As I couldn’t laugh properly, my dubbing work was removed. However, if you could watch the film thoroughly, then and there, you will find my voice. Next, I got to dub for the film Preminchukundam Raa, assistant VN Aditya said that I was just blowing air out of my mouth. He rejected me. This had touched my ego. I just wanted to prove myself in the dubbing at least once. When the opportunity came for Bavagaroo Bagunnara film, the union people (of dubbing artistes association) came to the studio and objected to my not having the card. This was followed by Rasi's film Pelli Pandiri. I sang and dubbed for this film. Till I achieved this moment, it was like "O Dubbing Repu Raa on the lines of O Sthree Repu Raa". In the meantime, my dad applied for the card to become a dubbing artiste. There was a big scarcity for new voice. The sentiment prevailed that my first film was a hit. The talk of a lucky girl gripped me. When I was doing anchoring for Gemini TV program (Navaragam), my counterpart for ETV program (Paduthaa Theeyaga) was none other than SP Balasubramanyam garu. Both were individual images. People really talked about the contrast. It was by virtue of SPB's grandeur that some new singers were introduced the film industry like Kausalya and Usha. Here, I suffered the loss in my career. It became a question mark. What is the interest of Sunita? But, music directors SV Krishna Reddy, Keeravani and Ramana Gogula supported me a lot. Again, I took up dubbing for the film Sri Seetharamula Kalyanam Chootam Rarandi. It was a hit. When I was approached for the film Choodalani Undi, I shuddered at it and almost escaped to Chennai to my aunt's place. For fifteen days, I remained out of contact. Chiranjeevi’s manager Mohan garu tried his level best to contact me. Back in Hyderabad, I told Mohan garu that I was not available due to some problems at the domestic front. I said all sorts of lies to him. But, he said that I could take up the work immediately. This was the project into which I entered without much interest. But, this turned out to be the magic moment in my career. The TV people kept approaching for a number of programs. There were seven offers before me, but I could take up just two. A big circle went by and I finished dubbing 100 films with total involvement. I was repeatedly asked to dub for heroine Soundarya. She thanked me many times for my work. Previously, the work was taken up by Saritha; and now, it's me. My respect for Saritha garu got doubled and trebled. Sneha introduces me to others as her voice. I entered into wedlock at the age of 19. I had more responsibilities as I had to support two families. Dubbing profession became a cash cow to me and it got me more money to support my family financially. I started understanding the difficulties in this profession. There should be support from the film industry. I started working with a diehard stubborn resolve. Mentally, I was very strong and am so till now. I never went in for reducing my self confidence. I never allowed depression to overtake me. I was not mad after dubbing, but decided to do when the offers would come to me. I learnt to take the struggle without regret. There was a record when I dubbed for 60 films in a single year. When I found the chance to sing when the voices of ace singers was rejected, I should also accept when mine too was rejected. I had seen lots of struggles in personal life and my struggles in professional life of nothing compared to my personal life. In the years that followed, I totally stopped anchoring. Now I am thirty year-old. The industry is mostly driven by ego factors. During the audio functions, most of the producers and organizers kept asking me to anchor the events. Even several years after I stopped anchoring, still I get calls from some production offices whenever their audios are releasing. But, for all my services as an anchor at audio functions, I was never paid a single rupee by any producer. As a TV anchor, I got good recognition with the program - Zee Sarigamapa (Sapthaswaralu.) My sailing on multiple boats simultaneously was purely the result of my conditions at the domestic level. Now I can't say no to dubbing when I am approached. Because they (the producers) had provided me livelihood when I was in troubles. Who were the heroines you contributed your voice to? Some of them are: Anitha (Nuvvu Nenu); Soundarya (prominantly Choodalani Undi and Ninne Premistha); Simran (Nuvvosthavani); Sonali Bindre (Shankar Dada MBBS & Manmadhudu); Sneha (Sriramadasu); Shriya (Nenunnanu); Kamalinee Mukherjee (Anand, Godavari); Sada (Jayam) and many more. Did you get any offers to do the heroine? Many. But, I am not interested. Even now, after marriage, many people ask me. They say my smile is beautiful and my features are sharp. What are your observations about RP Patnaik and Chakri who did not offered you many songs? I am happy that RP Patnaik and Chakri ruled film industry for a few years. It prevented the infiltration of Tamil music directors in Telugu. But over the period of time, their music became monotonous. Who do you think are the best music directors in Telugu now? I feel that Mani Sharma and MM Keeravani are the best when it comes to quality. When MM Keeravani calls me for a song, he would tell me about struthi in advance so that I could go prepared. There should be mutual respect between singer and music director. The standard of Telugu music was better when Telugu film industry was in Chennai. It deteriorated when Telugu film industry moved to Hyderabad. Dont you think new singers without any training or traditional background flooding the industry will damage the quality? Yes. The damage is already done. Everyone is responsible for this. There are singers who get proper training and come to the field with utmost respect for the profession. But, some music directors have created a feeling in the public that singing is just an easy job. This attitude led to a sort of disrespect for the singers. The great combinations like SPB-Chitra; SPB-Susheela are not to be seen in future. I am happy that music directors like MM Keeravani garu is making all efforts for quality singers. Unfortunately, some music directors are becoming a bane to the industry with cutthroat policy - Divide and Rule. This mal-tradition also crept into the dubbing field. RJs are making into this field and doing injustice to the Teluguness on the screen. Despite drawbacks a song when listened to repeatedly will automatically make one like it. This is how we can get some solace. This led to complete eclipse of the quality factor. See, this is not the case with the Tamil film industry, where music directors and singers command lot of respect in the industry and among the general public as well. I sincerely feel that all of us - music directors and singers should generate an atmosphere where everyone should respect his colleague and get respected by all. There is no short cut to success in music. Patience and talent alone will survive. Did you ever feel the boredom at your voice? No. I love my voice. It is god's gift. I give life to characters. Dubbing has great scope in animation industry. How do you look at it? Yes. It’s a welcome sign. How do respond to rumors? Sometimes they hurt people. I read in some websites that music directors Koti, Mani Sharma and Keeravani harassed me. What is this? They are so affectionate to me all the time. I am like a family member when I go to Mani Sharma's house. Koti garu calls me affectionately ‘yemma, nanna’ whenever I meet him. Keeravani garu always enquired about my son Akash whenever I meet him. These kind of mad comments are painful. I don't shudder at anything that comes my way. Naku edhi ishtamanipisthe adhi chesthanu. It's like past time I want to take up a program on the lyrics of Devulapalli Krishna Sastry garu on the FM radio. It's my big dream to add one more feather to the pride of Telugus by getting the National Award for playback singing. My love for Lalitha Sangeetham (Light vocal) and Folk Songs is unending. I am going to patronize these two genres in a big way. Your top ten favorite songs? Your top 10 dubbing works? Any plans to go to other industries? Yes. I got a great introduction in Tamil by singing in the music direction of maestro Ilayaraja. I am planning to get into Tamil and Kannada industries. What's your contribution to Rainbow? After Badri, I did the single-card playback singer for Rainbow. My association with music director Nihal dates back to 14 years ago, when I was associated with Ashirwad Studio, Vizag. I worked with him for the serial Ruthuraagalu. He made his debut as music director with Rainbow, and he made me involve into the project. He made me hear each and every tune. I joined the project out of my individual interest and that our family friend and well-wisher VN Aditya is making his debut as producer. These days, some people are asking me: What Suneetha garu? Mee cinema (Rainbow) enthavaraku vachhindi? They propagate that I am the producer of Rainbow. Moreover, some over lenient remarks are made about my association with Aditya garu. We know each other since my childhood. My sincere urge is that Rainbow should be successful, because Aditya is making his debut as producer. He kept whatever he has for this production and also pawned his efforts also (Kashtanni kooda thakattu pettadu). There was a time when the industry rejected him saying that he was not fit even as an assistant director. Which is your favorite song in Rainbow? I liked all the songs in the film. But, in particular, I liked Asha... Chinni Asha, Naa Kallalo and the bit song. Do you have any heart touching memories with fans? It was a touching moment when I came to know that an elderly man dies of cardiac arrest as he skipped his doctor appointment while watching my TV program ‘Jhummandi Naadam’. Another incident where a little girl fighting cancer used to call me every day and talk to me over phone.